Everyone&apos;s Welcome at Fort Wayne&apos;s Boundless Playground! Posted on September 11, 2013 at 9:00:00 am by Michelle M.
As summer draws to a close many of us will tuck away fond memories of playing outdoors with our children. We’ll remember laughing, climbing, hanging from the jungle gym and much more. 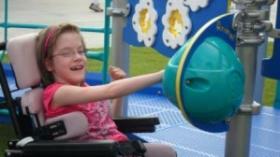 Unfortunately, playing at the playground is much more difficult for children who’s physical abilities are limited. That was the case here in Fort Wayne until a young woman named Taylor decided to change that. Inspired to find a solution when she realized not all of her friends could easily play on the playground, 11 year old Taylor Reuille partnered with the City of Fort Wayne to bring the first Boundless Playground, Taylor&apos;s Dream Boundless Playground, to Indiana in 2011. A Boundless Playground is a playground that allows all children, regardless of their limited abilities, to play. 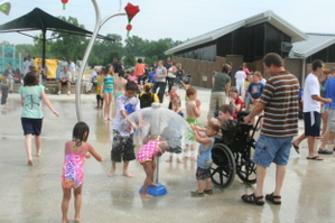 Fort Wayne’s 42,000 square-foot Boundless Playground is located in Kreager Park off of North River Road. Made up of three pods of playground equipment and activity areas, the playground offers accessible ramps and walkways, a splash pad, picnic pavilion and accessible parking. Surfaces, including landscaping, are designed to provide a sensory journey through the various surfaces used. Surfaces include sand, poured-in-place rubber, mulch and natural turf. The Alpha Pod, designed for children ages 2-5, encourages socialization and creative imaginative play. The Beta Pod, designed for children ages 2-13, provides mulit-sensory themed play and a Playworld System NEOS 360, the world’s first outdoor electronic play system. The Gamma Pod, designed for older children ages 5-12, offers opportunity for solitary and group play with motion play being an important part of this pod. The Gamma Pod features an “Aero Glider” rocking platform capable of handling two wheel chairs, wheel chair and pet friendly drinking fountains, elevated play areas with ramps and button activated doors in restrooms. Therapy Guides are available on the Fort Wayne Parks and Recreation website to assist parents and caregivers in utilizing the parks unique features. Children and families of all ages and abilities are welcome to enjoy Taylor&apos;s Dream Boundless Playground! Admission to the park is free.